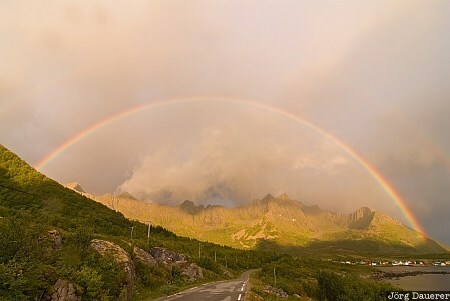 A full rainbow over the rugged peaks on the island Senja and a lone street near Mefjordvær. Senja is in the province Troms north of the arctic circle in Norway. This photo was taken in the morning of a rainy day in August of 2010. This photo is part of the exhibition Rainbow (February 2017). This photo was taken with a digital camera.